Why should six parcels in a sea of single-family homes be rezoned to benefit one single person? Christian Chernock is petitioning the City of Dallas to change multiple adjacent single-family parcels on N. Hampton Rd and North Boulevard Terrace to a multi-family planned development (Zoning Request #Z134-291). In his marketing materials, the developer claims to be emulating the work of renown architect and author Ross Chapin who is considered the pioneer of “Pocket Neighborhoods“. After reviewing the site plan and marketing materials for us, Chapin called the marketing material misleading and said that the developer was only giving lip service to the concept of pocket neighborhoods. So let’s not be fooled by the catchy name used by the developer. This development, plain and simple, is high density multi-family (MF-1) right in the middle of a well-established single-family neighborhood. It will have 42 units on 3.8 acres comprised of town homes, efficiency apartments and zero lot line homes. Color-coded map illustrates current land use patterns.For orientation purposes, Hampton runs top to bottom near the center of the image. The yellow area near the center of the image is the proposed multi-family development that is surrounded by single-family parcels. It is important to understand, that this is not a debate about the merits of pocket neighborhoods. The real issue is whether six parcels in a sea of single-family homes should be rezoned to benefit one single person. 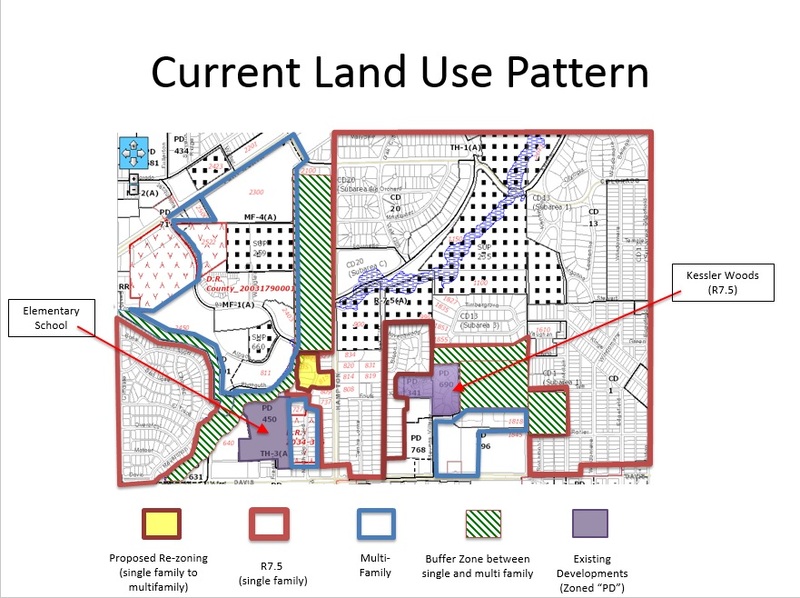 One glance at this color-coded map above and it becomes clear that that this rezoning request is contrary to a greater comprehensive land use plan. Moreover, the rezoning request disregards established buffer zones that exist between multi and single-family districts within the area. 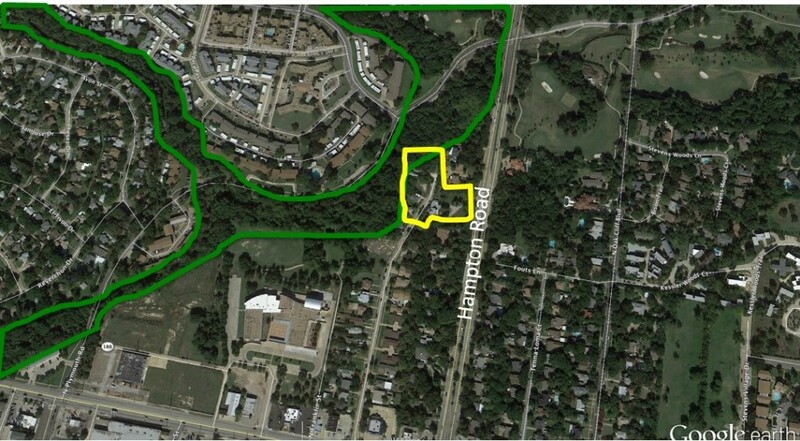 Coomb’s Creek (outlined in green) provides a well-established buffer between the high density multi-family apartments (upper left of center) and the single-family neighborhoods of El Tivoli (middle left) and West Kessler (bottom and right). This is not a coincidence. What is a Buffer Zone?